Welcome Music Teachers! We are so happy that you are interested in Point CounterPoint. We appreciate the trust you have placed with us to teach your private student while at camp. At the end of your student’s camp Session, you will receive written notification from a PCP faculty member who will explain our music interactions with your student. We like to communicate with you about how your student progressed at PCP and where we focused our time. If you would like to forward this website to your student for them to consider applying, please do so here. If you would like a poster, or postcards to hand out to your students, please call JennyB at 267-886-5359 or email at jennyb@pointcp.com . For over 50 years, PCP has offered multiple session lengths of chamber music on Lake Dunmore. We offer four 2 week sessions, and a session abroad for string and piano students ages 11-18. Many students choose to attend multiple sessions. Our average session enrollment is 45-50 students. In this section we will attempt to answer most of your questions. Our faculty change every two weeks so if you have any unanswered questions please feel free to email the Director of Music for the Session to which your student is applying. Our Executive Director, Jenny Beck, is comfortable answering non-music questions, if you have those too! 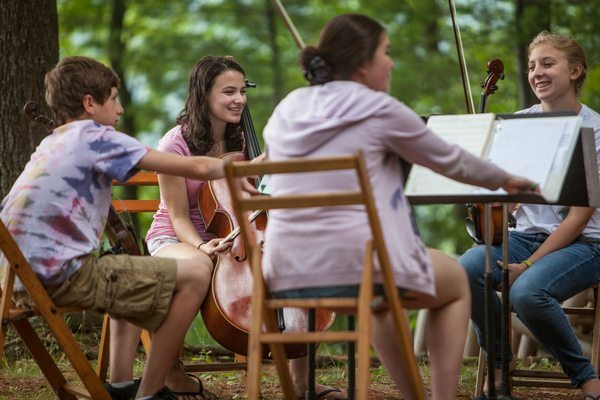 Chamber Music Groups – Each camper is placed in two different chamber music groups for the session. Once the piece is ready, the ensemble will perform for the entire camp in an appreciative and supportive environment. After that first piece has been mastered, the musicians will move on to the next challenge – a more difficult movement from the same work, or a brand new piece. Both pieces will be performed at the final concert. Weekly Music Program – Our weekly music program includes both coached and non-coached rehearsals, private lessons, private practice, music studies, and sight-reading. Daily Schedule – Each morning there are four music periods before lunch which are a combination of lessons, private practice, rehearsals, and music studies. Theory – Campers meet regularly in small music theory classes with other campers at their own level to work on basics like intervals, key signatures, and rhythm, or advanced topics like harmonic analysis. All-Camp Music Studies – weekly the faculty feature varied topics such as “How to rehearse without a coach,” “Shostakovich’s Russia,” “Performing for a Master Class with a guest musician”, or perhaps a preview of an upcoming faculty performance. Always popular with the campers is a faculty panel which shares insights about their own musical studies and careers. Other topics often include: Productive Un-coached Rehearsing, Fiddling, Composition, Instrument Care, Art of practicing, Art of Sight Reading, and Yoga. Private Lessons and Practicing – One thing that sets Point CounterPoint apart from other music camps is the amount of personal attention in the form of private lessons and coachings that each camper receives. The personal and nurturing attention of Point CounterPoint faculty in the informal setting on Lake Dunmore often creates a special bond between student and teacher. Every camper has two scheduled practice periods daily; many also choose to spend a portion of their free time practicing. There is a chance that solo music can be addressed, however, our focus is on the pieces they will be performing at camp. Performance Opportunities – Students will have the opportunity to perform at least twice weekly via our evening Master Classes with faculty and our Sunday afternoon Family Concerts. Students will also have the opportunity to play at a local medical facility. Final Concert – Students perform both of their pieces on the final session Saturday concert held at Salisbury Meeting House which is open to the public. Faculty Concert – There is a public Faculty Concert held once per session in which our faculty perform to a large audience. Their presentations of major works of the chamber music repertoire excite and motivate campers in their own musical growth. This popular series builds an intimate awareness of the discipline and joy of professional music-making. Post- faculty concert, we usually see an increased enthusiasm and commitment by the students.